The Sacramento division of the Southern Pacific had close to 150 miles of grades of up to 2.5%. On this Roseville - Sparks line over the Sierra Nevada there were also almost 30 miles of snow sheds and tunnels. Over the years, as trains grew in length, more powerful locomotives were required. In 1908 the Southern Pacific ordered two 2-8-8-2 conventional mallets classified MC-1 (Mallet - Consolidation) numbered 4000 and 4001. On a trial run up the "Hill" two problems became immediately evident. The great volume of exhaust gasses almost asphyxiated the crew. The stack exhaust velocity was so great that it blew the roof boards off of the snow sheds. The second problem was easily handled by installing "stack splitters" (a deflector located above the smoke stack which directed the exhaust to the sides), as shown at the top of the image on the right. The first problem required more consideration. Shortly after delivery of the MC-1s, an enterprising engineer decided not put up with nearly being asphyxiated or exposing himself to the tremendous heat and noise. He had the engine turned, hooked the engine pilot to the front of the train, and backed his locomotive over the hill pulling the train behind. This alleviated the above problems but created others such as pushing the tender ahead of the engine and the engineer being on wrong side for the signals. Despite these problems, other engineers began following this example. A team of Southern Pacific design engineers came up with a plan and designs for a mallet with the cab in front, classified MC-2. Southern Pacific had Baldwin build 15 without testing one! Numbered 4002-4016, they were delivered in February and March of 1910. The engineer's and fireman's controls were shifted to opposite sides of the cab so that when run "backwards" the crew was on the usual side of the track. Since the firebox on these locomotive was located in the front (far from the tender), they were designed to burn oil. Oil was piped from the tender along the locomotive to the firebox. The oil bunker in the tender on these locomotives was made air-tight and was structurally braced. They were slightly pressurized with air from the main air reservoir to insure a constant oil flow to the burner in the fire box when to the locomotive when traveling upgrade. After the MC-2s had proven themselves, 32 more, classified MC-4 and MC-6 (MC-3 and MC-5 were skipped) were ordered. Before it was all over, Southern Pacific ended up with a total of 256 Cab Forwards (all classes). these Cab Forwards came in several wheel arrangements including 2-8-8-2, 4-6-6-2, and 4-8-8-2. Although the crews initially complained about concerns that if they hit a gasoline truck at a grade crossing they would be right on top of it when it exploded. Fortunately, in 46 years of running Cab Forwards, this never happened. This was partially because of the unobstructed view from the cab. The advantage in visibility was tremendous. Cab Forwards were a distinct trademark of the Southern Pacific. They were sometimes also called "Cab-in-fronts" or "Backup Mallies" (even though, technically, only some of the first classes were true mallets). According to the definitive book on Cab Forwards (Those Amazing Cab Forwards by George Harlan), no other railroad in the world had locomotives like them. However, a few other unique examples did exist. What did those Cab Forward cab markings mean? The Southern Pacific Cab Forwards had a platform immediately following the smokebox of the locomotive (as shown in the figure to the right). This platform was called the "monkey deck. Smoke boxes were often stained with rust from boiler water and boiler water treatment chemicals. Because of its proximity to the stacks, the monkey deck was often stained with rust from boiler water too. Occasionally articulateds would spew hot water and mud from their stacks. Most railroad employees were aware of this fact. However, many hoboes thought the monkey deck was a good place to ride. After passing through tunnels or snow sheds, hoboes riding the deck were either scalded or asphyxiated depending upon how the locomotive was performing. The monkey deck was not a good place to ride on Cab Forward locomotives. Not all Southern Pacific articulateds were Cab Forwards. Class AC-9 was made up of 12 Lima built Superpower, coal burning Yellowstones (2-8-8-4). They had the same tractive effort of the Cab Forwards. They were numbered 3800 - 3811 and were used in the Southwest. The last Cab Forward in revenue service was 4-8-8-2 4211 which hauled freight from Oakland to Davis and then to Roseville with only a caboose on November 30th, 1956. In November, 1957 4274 was brought out of retirement to make the last run of a Cab Forward over Donner Pass from Sacramento to Sparks and back. In 1960 the last Cab Forward to be scrapped was AC-10 4243. On May 7, 1981 AC-12 4294 was designated a National Historic Mechanical Engineering Landmark. See Locobase 344 for the first several classes of this unique "backup" design. The current entry shows the wartime production batches, which were identical one to another in all but the most minor details. They were the heavyweights of the AC stud, but retained all of the basic dimensions of the prewar engines. One difference was in the amount of superheater area. Firebox heating surface area included 141 sq ft (13.1 sq m) in the combustion chamber.. Piston valves measuring 11" (279 mm) in diameter supplied each of the four cylinders. The design also included a Worthington 6SA feed water heater. As noted in Locobase 9294, the Espee later reduced the figure in its postwar diagrams. Locobase suspects the decrease represents removal of some of the elements. Data from SP Menke All Time Steam Locomotive Diagrams supplied in May 2005 by Allen Stanley from his extensive Rail Data Exchange. See also DeGolyer, Volume 82, pp. 590+ (AC-4), 622+ (AC-5), 653+ (AC-6) and "Southern Pacific's New Powerful Locomotives," Railway Journal, Volume 35, No 1 (January 1929), pp. 22-26. This entry covers the first 25 of 195 built-from-scratch simple-expansion "cab-forward" or "back-up" locomotives supplied by Baldwin to the Espee from 1928 to 1944. The RJ report saluting the delivery of the first batch said the general specs were drafted "under the supervision" of General Superintendent of Motive Power George McCormick. The cost of each locomotive was $1.4 million. Weight grew with each batch. The specs show the lightest-weight AC-4. All had Worthington 4 1/2 BL feed water heaters. AC-4 -- works numbers were 60575-60576 in August 1928, 60622-60625 in September, 60666-60669 in October 1928. AC-5 -- works numbers were 60866-60869 in June 1929, 60884-60889 in July, 60952-60957 in August 1929. Weight on the drivers rose to 482,500 lb (max axle loading rose to 61,900 lb) with a total engine weight of 622,600 lb. The simples succeeded the compound "back-ups" first in service in 1910 (see Locobase 3558). They had 11" (279 mm) piston valves on all four cylinders. The combustion chamber ahead of the firebox contributed 146 sq ft (13.5 sq m) to the direct heating surface area. Feed water heater was a Worthington 4 1/2 BL on the fireman's side. These oil-fired engines had three ostensible disadvantages--and one big advantage--over conventionally laid-out locomotives. The disadvantages were the crew's vulnerability in a collision, the need to keep a high water level in the long boiler to account for grades, and an occasional back blast from the firebox from flameout and sudden relight caused by the long distance from tender to grate. (The fuel was helped through the lines by an 5-lb overpressure in the cylindrical tender.) The great advantage was the reduction of smoke in the cab when travelling through the miles of tunnels and snow sheds between Roseville, Calif and Sparks, Nevada. This type eventually ranged over much of the Espee system. See AC-6 (Locobase AC-7 (Locobase 9294) and AC-10 (Locobase 344) for later engines in this arrangement. Twenty six "backups" had already been delivered according to the specs shown in Locobase 344. With the AC-6s, however, weights rose substantially and boiler construction included thicker-gauge tubes and flues on the last fourteen as boiler pressure rose to 250 psi.. Even so, Locobase finds no obvious differences that accounts for a superheater area reduction of 253 sq ft (23.5 sq m) to 2,735 sq ft.(254.1 sq m). Like the earlier AC batches, the AC-6s had 11" (279 mm) piston valves on all four cylinders. The combustion chamber ahead of the firebox contributed 141 sq ft (13.1 sq m) to the direct heating surface area. Feed water heater was a Worthington 6S. See AC-7 (Locobase 9294) and AC-10 (Locobase 344) for later engines in this arrangement. As the SP's traffic levels began to recover from the impact of the Great Depression, the railroad went back to Baldwin for more oil-burning "backups". Although the design was essentially the same, it had gained weight over the intervening years. Some of that weight came from the new one-piece bed castings of both engine units produced by General Steel Castings. Each unit included integral cylinders, their saddles, crossties, valve motion bearers, and the entire keel of the locomotive. The specs show the AC-7 weight because the AC-8s bulked up to the final weight shown in the AC-10 entry (Locobase 345). As produced they were credited with the nearly 3,000 sq ft of superheater surface area found in the earlier engines. After World War II, the area dropped to 2,300 sq ft (213.7 sq m) although none of the basic values were changed. This suggests that some of the elements were removed although the flues remained. These were fitted with the Worthington 6SA feed water heater. AC-8 (62266-62292 in July-October 1939) put 531,000 lb on the drivers and 657,000 lb on all engine axles combined. See AC-4 (Locobase 344) and AC-10 (Locobase 344) for the other engines in this arrangement. Heedless of the debate over their utility recounted in Locobse 11060, the Espee's 4-6-6-2s entered the twenties as compounds. At that point, they were "simpled" and redesignated Articulated Moguls. The railroad added a Worthington 4 1/2 BL feed water heater. In addition to the tender shown in the specs, the railroad used two others that held less water and slightly less oil. Obviously satisfactory for certain kinds of service, the locomotives endured through a number change in the late 1930s (to allow grouping of the ACs) and World War II. Retirement came in 1946-1948 with 4203 being withdrawn in November 1946 and 4207 completing the reduction in September 1948. Sacramento, 1969. Mac Owen & Joe Testagrose Collection. 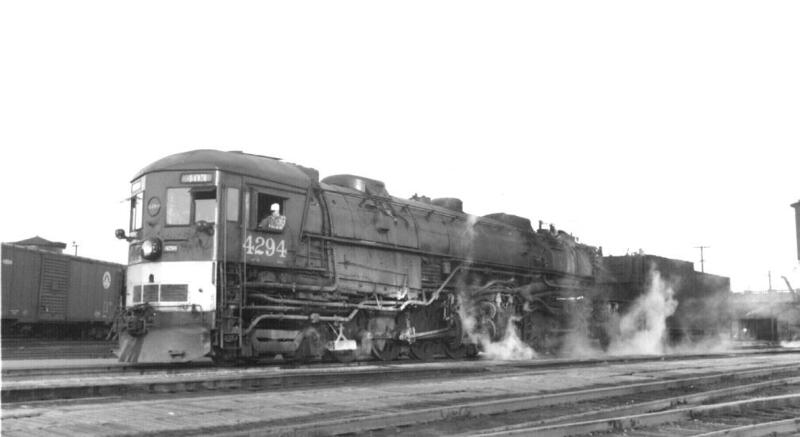 4294 was officially retired on March 5, 1956. The Railway and Locomotive Historical Society lobbied the SP to preserve 4294. 4294 was donated to the city of Sacramento and put on outdoor display at the SP station next to the C.P. Huntington on October 19, 1958. After 1964, construction of I5 required that 4294 was moved. It was moved to the SP shops. It was displayed/stored outdoors. 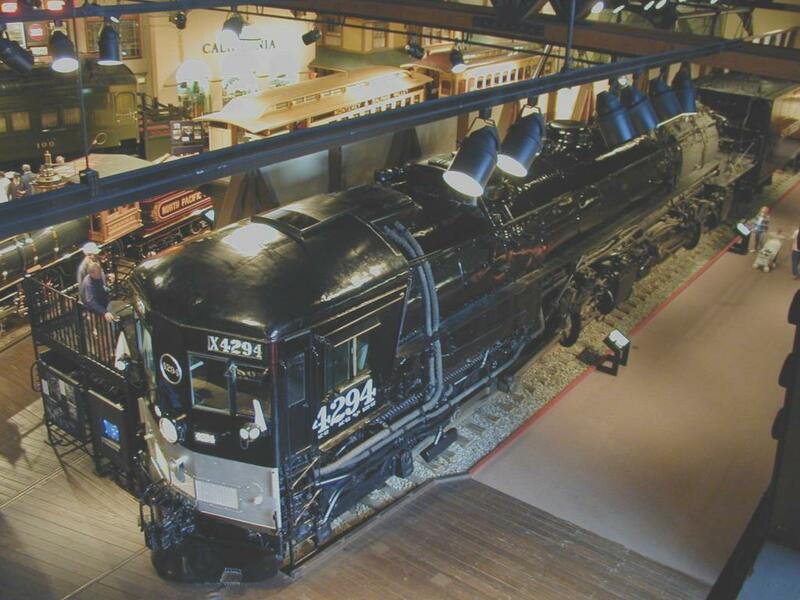 In May, 1981, 4294 was cosmetically restored and moved from the SP shops to its current location inside the California State Railroad Museum. Restoring 4294 to operating condition was once considered. However, the standard impediments prohibited this from further consideration.